Exclusive LR Rivals of Ixalan Preview Cards! This time around we’ve got some powerful uncommons from Rivals of Ixalan for you. 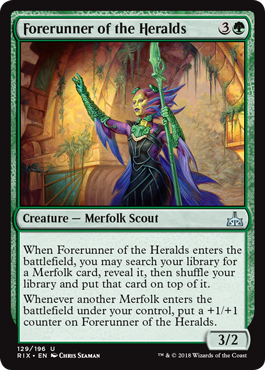 Each of these forerunners searches up a relevant creature type, puts it on top of your library, and then rewards you for cast it (and others of its tribe). 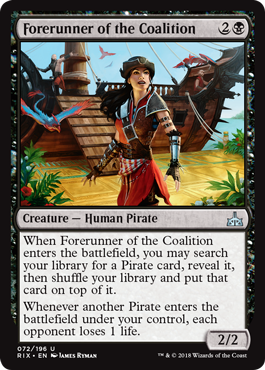 This is the pirate forerunner, and it’s representative of how these will play out. You’ll get a mediocre body and no card advantage, BUT you’ll also get some nice card selection and a bonus for being super tribal. One of the things that comes to mind of course is the ability to search up a big bomb with these. If you have a big tribal bomb going, you should want these even more than normally. Also: This one in a great enrage enabler. This might be the most powerful one in that it’s the best body on its own, plus it just gets bigger as the game progresses. I’m not sure how I feel about the vampire version. The body is small, and the effect fleeting. Probably still worth it though if you are tribal enough. 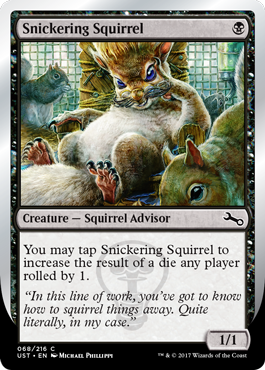 Snickering Squirrel seems to straddle the line between Squirrel tribal and dice rolling something-or-other? 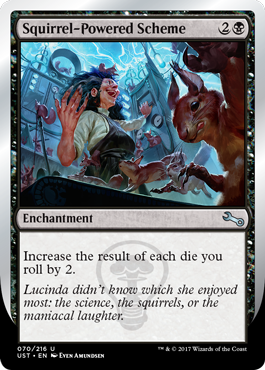 I just like that we now have a Squirrel Advisor in Magic. Squirrel-Powered Scheme. 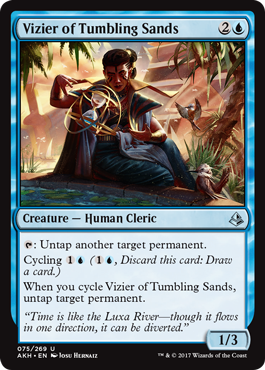 A card name I never thought I would be previewing for Magic but here we are. 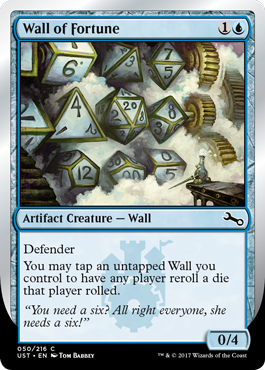 Wall of Fortune seems to fit with some wall theme but also messes strongly with die rolling stuff. Or something. Exclusive LR Ixalan Preview Cards! 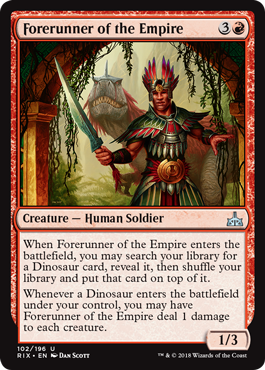 We’ve got three uncommons from Ixalan as exclusive LR preview cards today! 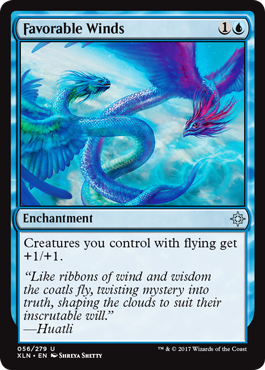 Favorable Winds is a sweet little build-around that turns a potent flying clock into a one-turn-faster potent flying clock most of the time. You have to get a lot of flyers to make this work, but it pays you back for the two mana and a card in full when it’s good. Flying tokens also make this better so we’ll keep an eye out for those. 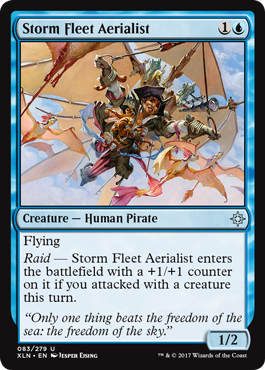 Storm Fleet Aerialist is a sweet little flying Pirate that heavily rewards you for playing aggressive one-drops but also just is mana efficient in the middle part of the game either way. 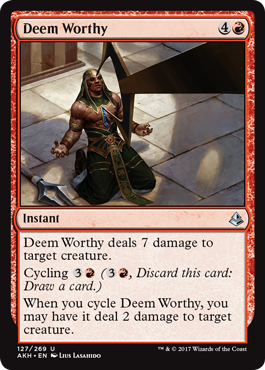 The truth is that you’d usually pay 2U for a 2/3 with flying and this will often be that card but cheaper, even on turn three. I love it. 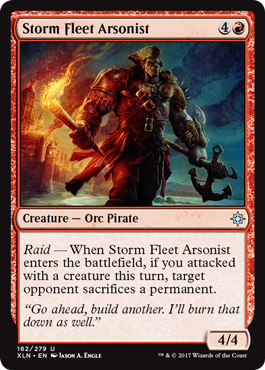 Storm Fleet Arsonist lives in a hotly contested slot: the dreaded five-mana slot. The competition here is usually quite strong, and on top of that most decks usually only want a few cards of this casting cost in them. Still, if you are being aggressive and attacking a lot, this is the kind of card that can just set the opponent back enough for you to get the job done. They can sacrifice lands to this which makes it a little worse, but if you attack on turn five, then play this, you are getting *something* relevant most of the time. Exclusive LR Hour of Devastation Preview Cards! 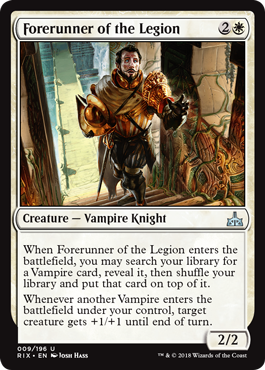 We’ve got another cycle of exclusive preview cards for you, this time from Hour of Devastation! 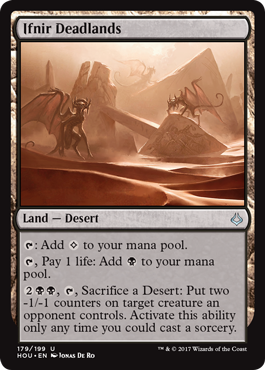 We’ve seen that deserts — either controlling them or having them in your graveyard — is an important sub-theme in Hour of Devastation and here we have a powerful cycle of uncommon deserts for you! 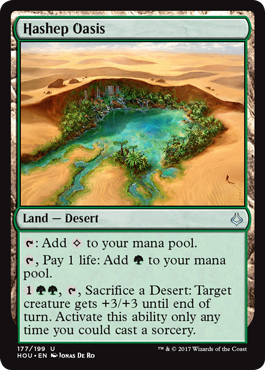 Hashep Oasis is our first one, and as you can see, these do not enter the battlefield tapped, but they also only tap for colorless mana naturally, UNLESS you want to pay a life, in which case you can tap them for a single color of mana. 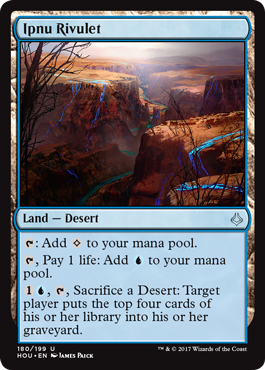 This is already quite good as they meet the desert requirement for the cards that care about deserts while not slowing you down on mana. But, like the whole cycle, they also have an activated ability that involves paying some mana, tapping, and sacrificing *a desert* (not necessarily itself, but it can be) to get a spell-like ability. This is traditionally quite powerful and these are no exception. +3/+3 on a creature is a lot of power and toughness, even if you can’t get it at instant speed where it would really excel. 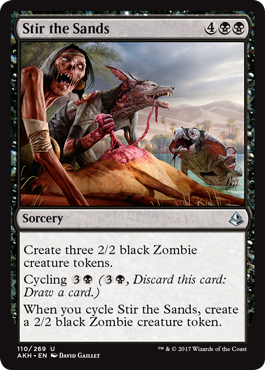 Ifnir Deadlands is the black version of this cycle, and it’s ability is even more powerful than Hashep Oasis. 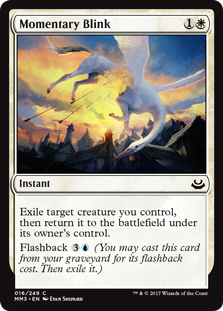 You can proactively shrink or kill an opposing creature, and lands that turn into removal spells are usually very powerful. Ipnu Rivulet is the cheapest to activate of this cycle, but also the least effective, at least as far as the board is concerned. 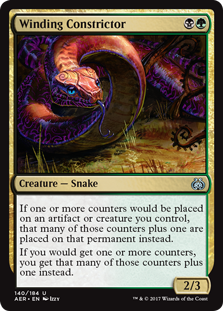 In Limited, four is a lot of cards, but you’d need a pretty sweet desert-based control deck and multiple copies of this to make it great. That said, this strategy is very hard to interact with and doesn’t come at a high cost. The last time we had a land that milled, it became the win condition in a Pro Tour winning Standard deck. Just sayin’. 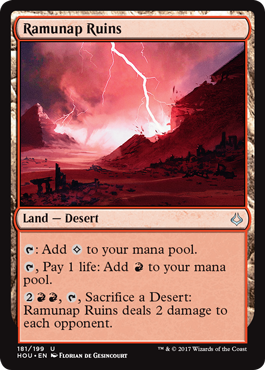 Ramunap Ruins is kind of interesting but also probably not the strongest of the bunch as it only hits opponents. 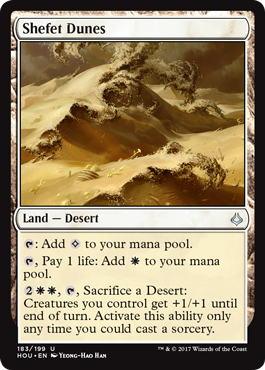 Again, these deserts are pretty low impact on your deck build as the downside is very low and the upside is having deserts in your deck which unlocks the power of some of the cards in this set. 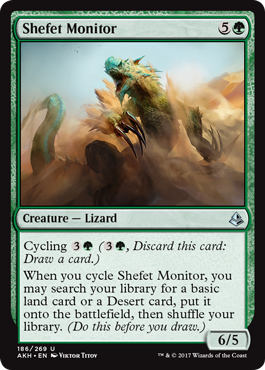 Shefet Dunes rewards having a wide board state, and gives you a reasonable if slightly pricey payoff. 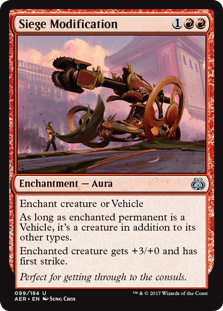 Once again, sorcery speed hurts this a bit, but if you have the right board state it probably won’t be a huge deal. As always, Luis and I will be discussing these on the show this week! Exclusive LR Preview Cards for Amonkhet! 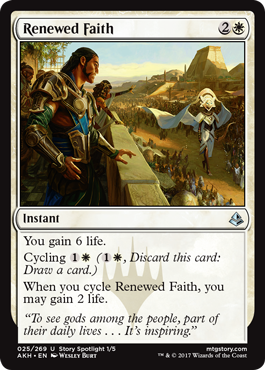 Here are our preview cards for Amonkhet! We’ll be discussing these on the show this week of course. WOW. That’s a red removal spell! Nimble Innovator that can just be much much bigger and better? Yes please. Exclusive LR Modern Masters 2017 Edition Preview Cards! 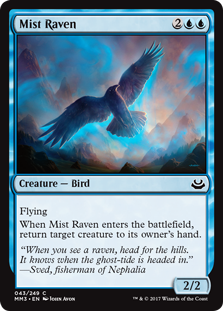 Mist Raven is one of my favorite cards of all time. It’s a flying Man-o’-War. It’s like a Man-o’-War but it flies. Let that sink in. How sweet is that? I cannot wait to draft and cast a bunch of these in the format. Also: That sweet sweet John Avon artwork is still here. This is the kind of card that can put a game away if well timed. Yes, you need a good target, and yes you need to make sure the way is clear, but the fact that you get to take a trip directly to the center of Value Town means that it’s often worth it. So yeah. It seems like we know what UW is up to in Modern Masters 2017. I like where this is heading. Many have asked for a long time for me to break down the gear and software used to make the podcast, videos, and other content that I make for LR, CFB, and my other endeavors. So here it is, current as of the time of writing (Early 2017). Before we dive in, I also feel the need to reiterate my stance on the whole gear thing: It’s just not that important. Most of the higher end stuff is past the point of diminishing returns as far as quality goes, and it’s just used to get your show’s quality from 80% great to 90-something% great. Your focus should *always* be on the content itself and not on the gear. That said, I *love* the gear aspect of this stuff as technology has always been a big passion of mine. So I’ll be geeking out pretty hard here, and this is aimed at the people who also get excited by new computers and gear. Where applicable, I will also offer a more budget friendly option to what I currently use. 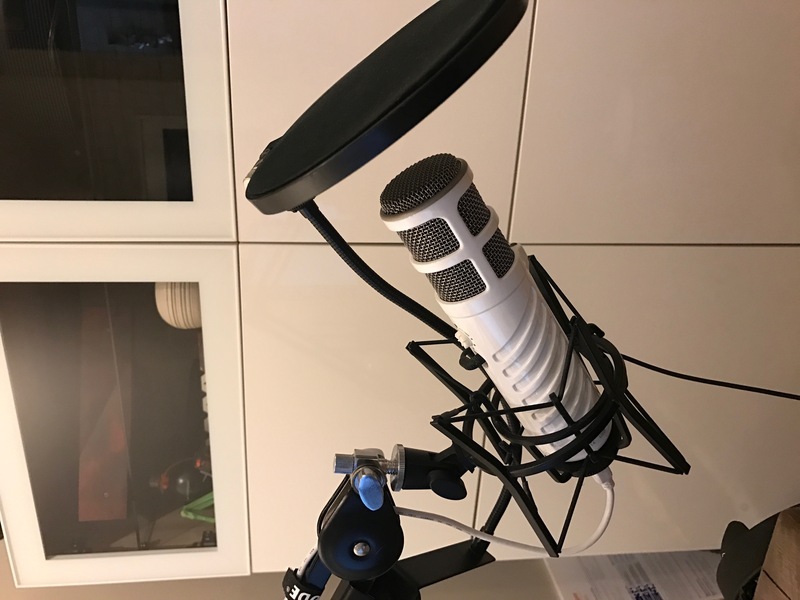 I’ve been doing the podcast for over seven years and have built up my gear since the beginning, but if you are just starting out you can use the budget friendly recommendations to get going. I used many of the recommendations for years before saving up to upgrade. First is your computer. This is the hub for all of your recording, editing, uploading, idea-making, all of it. I use Mac computers and have for a while. Windows has made strides and Windows 10 is a very reasonable option at this point as well. I prefer Macs because the build quality is second-to-none, they are generally well thought out designs, and they just work. I also put a premium on things that I use every day and am willing to stretch my budget if I think it makes my day-to-day life a little better. For my home setup, I use a 27” iMac with 32GB of RAM and an i7 processor. This computer is a beast and does a great job with anything I throw at it. This is my second iMac, and I will get another one this year some time. I like to get nearly maxed out computers and then sell them to fund the upgrade to the next one. Apple computers hold their value quite well and tend to last a long time. My next iMac will be a 27” with retina display. I also use a second monitor as it makes editing easier because I can fullscreen my editing program and still watch Magic streams . 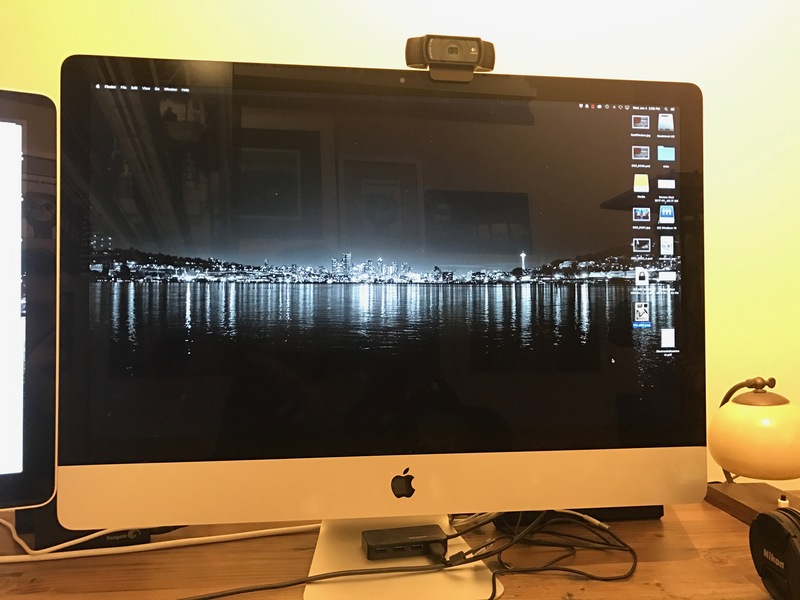 I use an Apple CinemaDisplay, 24” that I have had for years. It’s still trucking right along, though I may replace it in the next year or so with a 5k monitor. For my travel setup (this is important when you travel as much as I do) I use an early 2015 Retina Macbook Pro 13” with an i7 processor and 16GB of RAM. 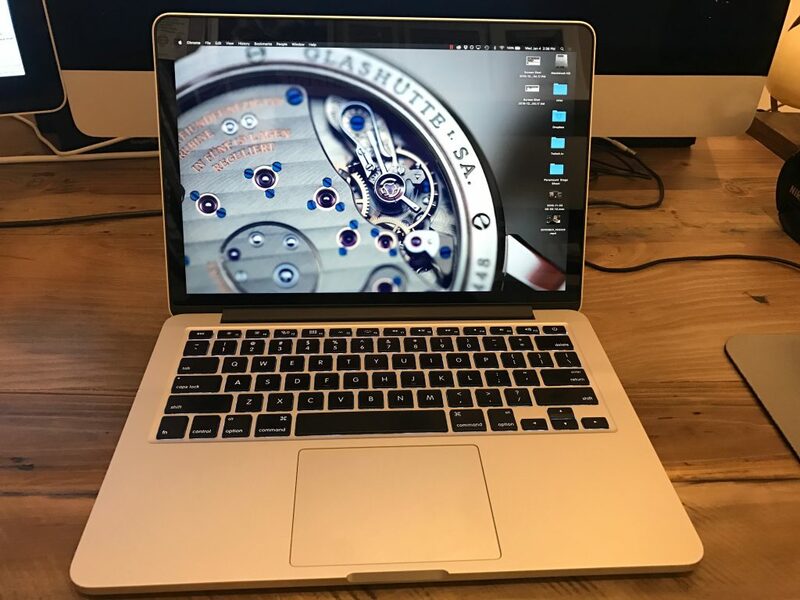 The 15” Macbook Pro is a fully capable editing and recording machine that you could even use as your main computer at home (with the addition a separate monitor). The 13” inch is much more portable, fits better on airplane trays, and is pretty darn powerful to boot. The main difference is that it uses an integrated video card rather than the discreet video card on the 15” model. For editing 1080p video, editing audio, recording the podcast, and even doing screen recording for draft videos it works just fine. Budget Recommendation: Windows has some fantastic and powerful laptops and desktops for very good prices. My favorite are the Dell XPS line, as they are very well built, a pleasure to use, powerful, and not ridiculously priced. A well-spec’d Macbook Air will also handle most of these tasks well. I use a Rode Podcaster USB mic. It offers clean sound, and has been very reliable for me. 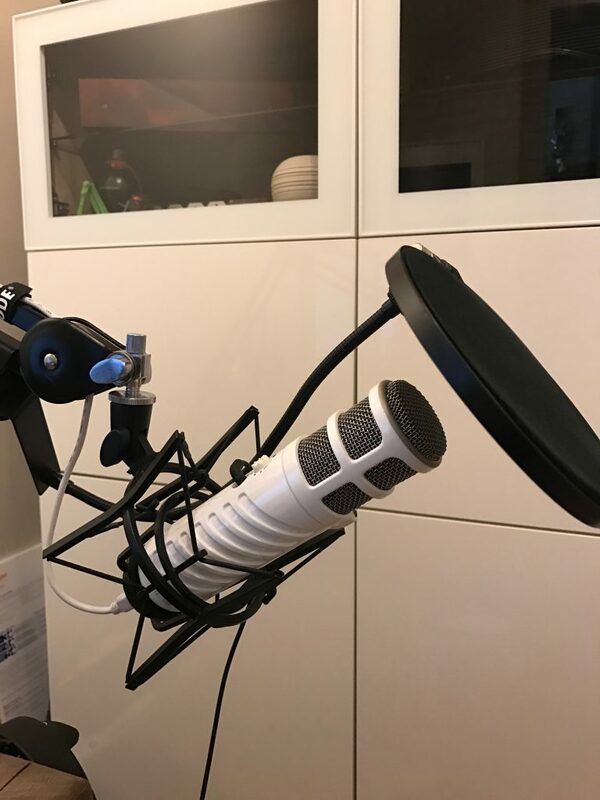 I also use a pop filter with it, as well as an adjustable arm so that I can get it where I need it any time without moving it on a hard surface. It costs around 230USD. Budget Recommendation: Blue Microphones Snowball mic. I used this for years and it was a solid little mic for about 70USD. Another option is a headset with microphone. These sound WAY better than you would think they should, and they are cheap (~40USD) making them a good budget choice. For home, I use a pair of AIAIAI headphones. Their site is really sweet in that you get to customize the headphones to your use and budget. You choose the drivers, ear pads, cable, headband, all of it. You also can tailor it to your budget. Also, the parts are interchangeable so you can switch them around based on your preference. 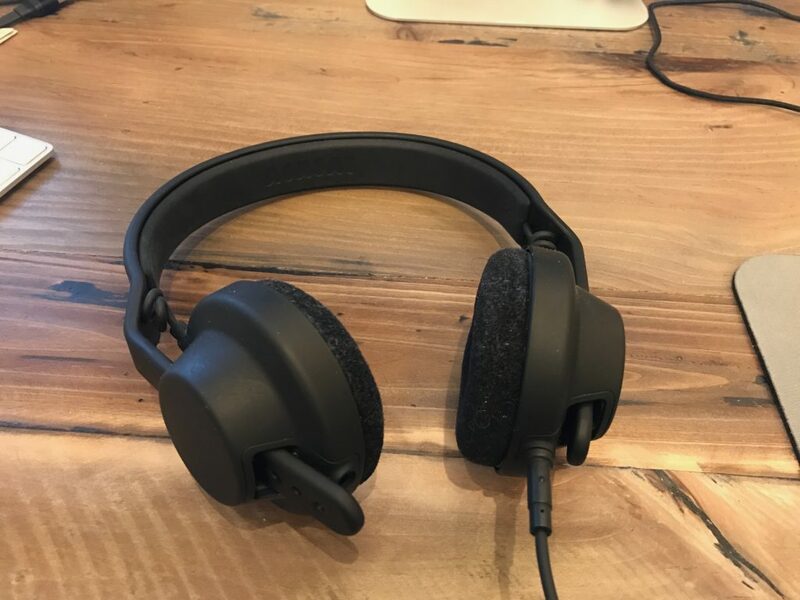 The sound isolation is pretty good for recording the show (if your headset bleeds sound, the microphone can pick it up and create an annoying echo), and they are comfortable. For on the road, I use a pair of CIEMs (Custom In Ear Monitor) from a company called 64 Audio. It’s a bit involved to get these, as you have to go to an audiologist and have an impression of your inner ear taken. Then they use that impression to make a set of headphones for JUST your ears. As you might imagine, they fit perfectly. 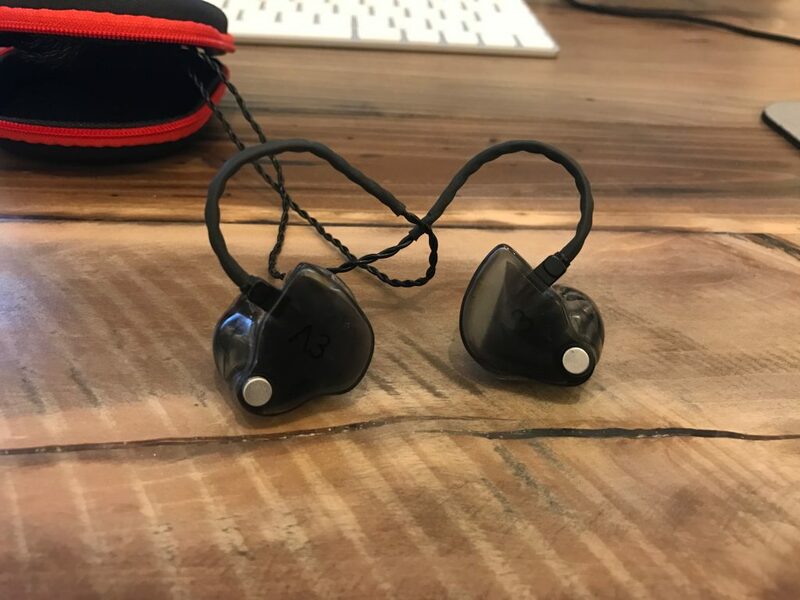 I use these for all of my on-the-road stuff as they are very small and portable, offer excellent sound quality (honestly, they sound ridiculously good), and are *fantastic* on the airplane as the block out most of the (much louder than you think it is) ambient noise on the plane. The ambient noise on an airplane is both very annoying for trying to edit audio of any type, but it’s also potentially harmful to your ears to be exposed to it for long periods of time. Additionally, I find that it reduces my traveling fatigue to be able to just block it all out. Budget Option: iPhone headphones or the headphones that came with your phone. I’ve used these to edit, and while the sound isolation and volume levels leave a lot to be desired, they are very cheap and can get the job done in a pinch. For recording audio on the road, I use a ZOOM H6 portable audio recorder. This thing is fantastic. I was hesitant to get one, as they are kind of spendy at about 350USD, but I sure am glad I sprung for it. It’s given me a ton of great use for different projects. Mainly I use it to record the podcast when we are traveling for the Pro Tour and such. 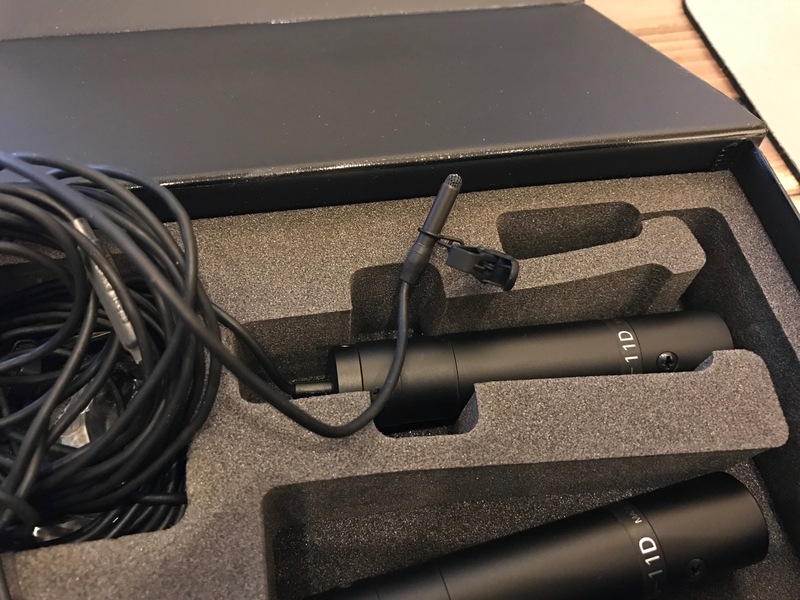 It has four XLR inputs for external mics, as well as a great interchangeable main microphone. It also can connect to my laptop via USB to act as my main microphone for recording the podcast or doing a video. It’s fantastic. For the actual mics, I use a set of lavalier (these are the clip on mics) microphones from a company called Sanken. These were about 300USD each, but the sound quality is comparable to when we are recording at home, so it was worth it. 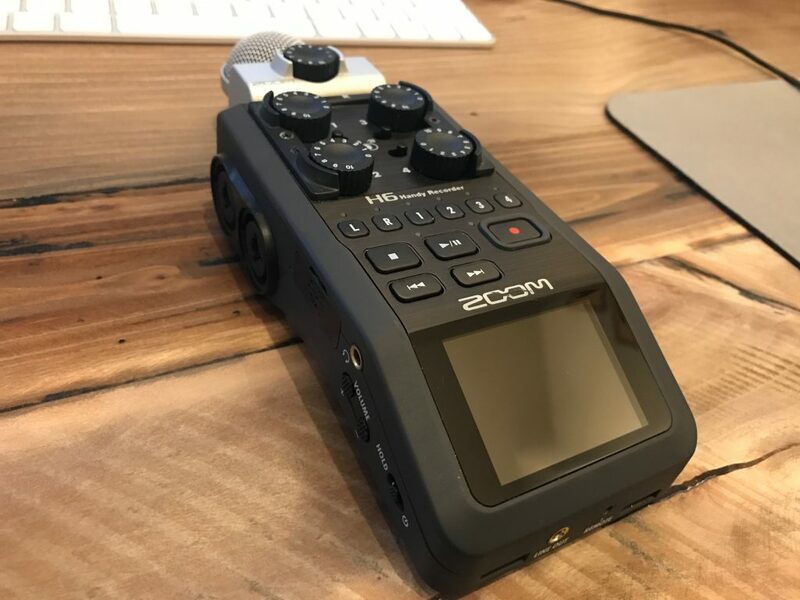 Budget Option: For a fully featured portable audio recorder, you can use the ZOOM H4N which is 200USD. For the mics, I used a pair from Shure that sounded pretty good (but not good enough for my taste) that were about 80USD each. Software is a huge piece of the puzzle, and there are a lot of options for getting most of the things you want to get done. Since I use Macs, some of the software I use is Mac specific. A lot of it is available on Windows as well, and all of it has analogs that are available on Windows in one form or another. First and foremost, I use the Adobe suite of software for creating my content. I use the Adobe Creative Cloud service, as it’s an insane value for someone like me who is constantly producing content. It’s not cheap: 55USD per month, but it gives you constant access to every one of Adobe’s programs, and they are all updated to the latest version once they come out. 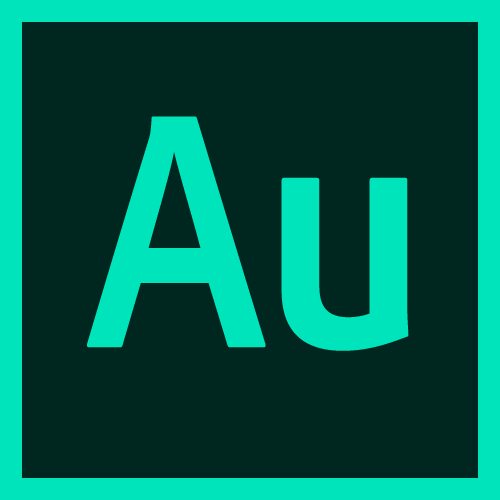 Adobe Audition CC for editing the podcast and any other audio. I find Audition to be pretty darn good for what I use it for. There are other pro options available like Pro Tools, but the fact that Audition is good and comes as part of the Adobe Creative Cloud suite leans me in that direction. 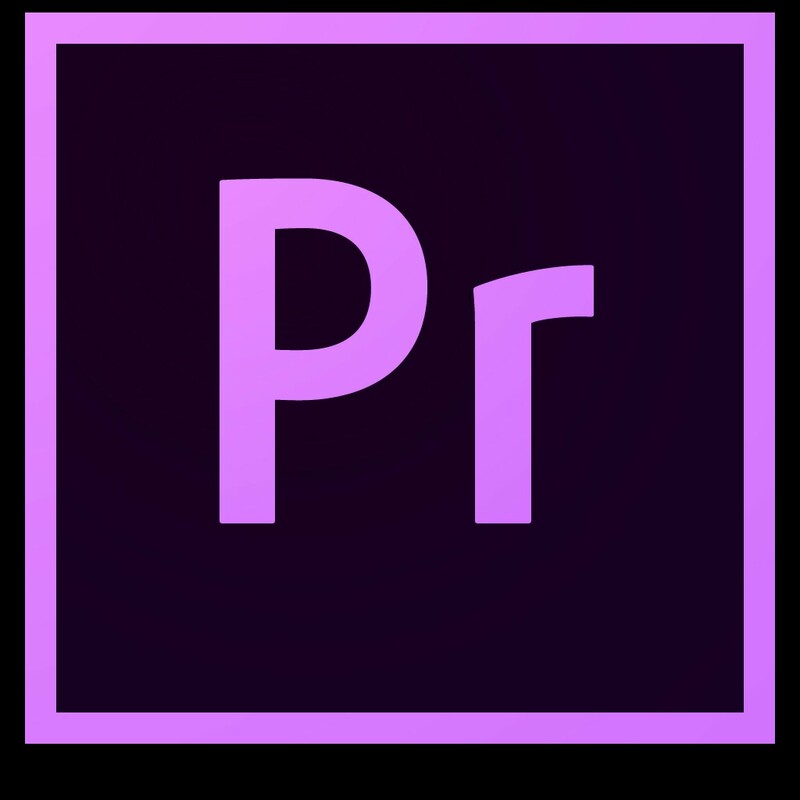 I use Adobe Premiere CC for my video editing. For Apple users, the decision is primarily between Premiere and Apple’s Final Cut Pro. Both are excellent programs, and are quite similar. I use Premiere because it fits my mentality about editors, is a bit more ubiquitous, and because it’s part of the Creative Cloud. I also use After Effects, Photoshop, Illustrator, and Lightroom for random projects related to work (and some unrelated to work too). Budget Options for Editing Software: Adobe Premiere Elements is 59USD and gives you most of the functionality of the full pro version. If you are a Mac user, you can use iMovie which comes with your computer for free. For audio editing, Audacity is a fully featured and free program for both Mac and Windows, and it’s really powerful. If you are a Mac user, GarageBand is a fine editor as well (I edited LR in GarageBand for two years when we started out). 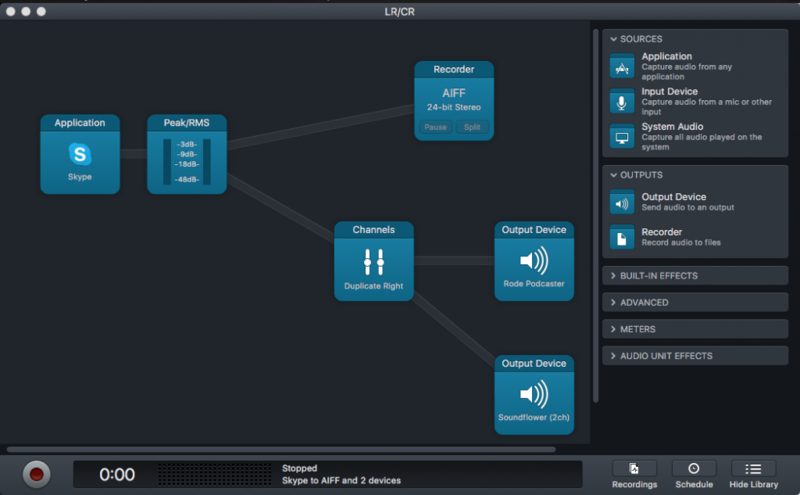 For routing audio to the right places and recording the podcast, I use a Mac only program called Audio Hijack. It’s great at gathering and recording audio from different sources on the computer, and creating a base recording of it. It’s 49USD. For the actual audio on the podcast, we use Skype. Besides being somewhat unreliable and finicky at times, it gets the job done. It’s free. 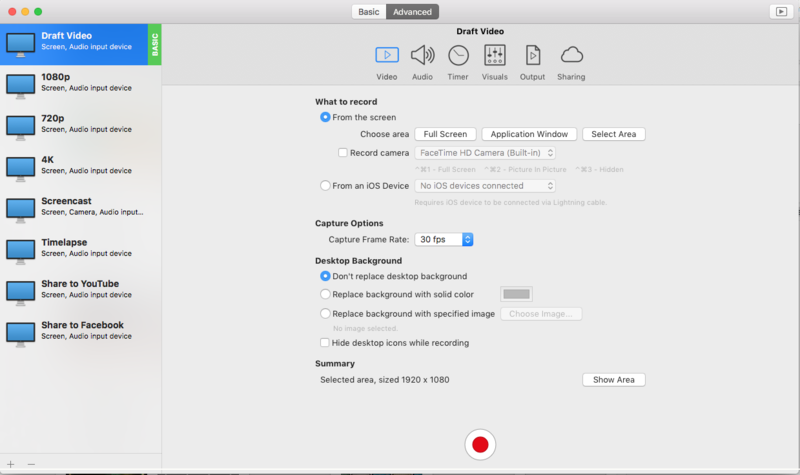 For recording my screen on draft videos and such, I use a Mac only program called iShowU Instant. It has a lot of configuration and quality options and does a good job. It’s 24USD for the base version. For streaming, I use OBS, which is an open source multi platform program that gets the job done. It’s free. 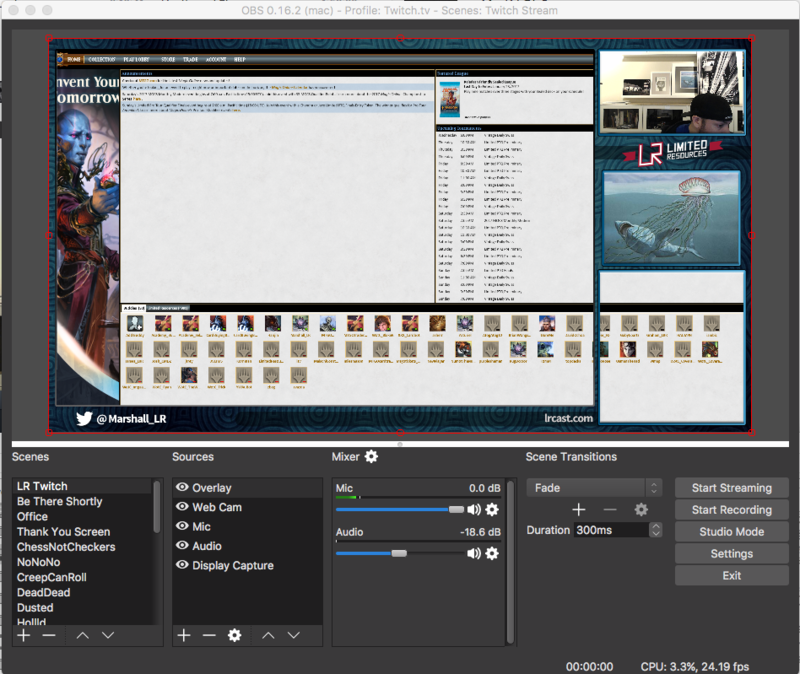 Budget Option: For screen capture software, you can use OBS which has a mode built in to capture the screen. It’s not fancy, but it works. For video recording like vlogs, I use the camera setup I already have for my photography. I’ve been a photographer for a long time, and even sold my photos at local art fairs for a couple of summers back in the day. Thankfully, my hobby of photography transferred over to my job when I wanted to do some vlogs and such. 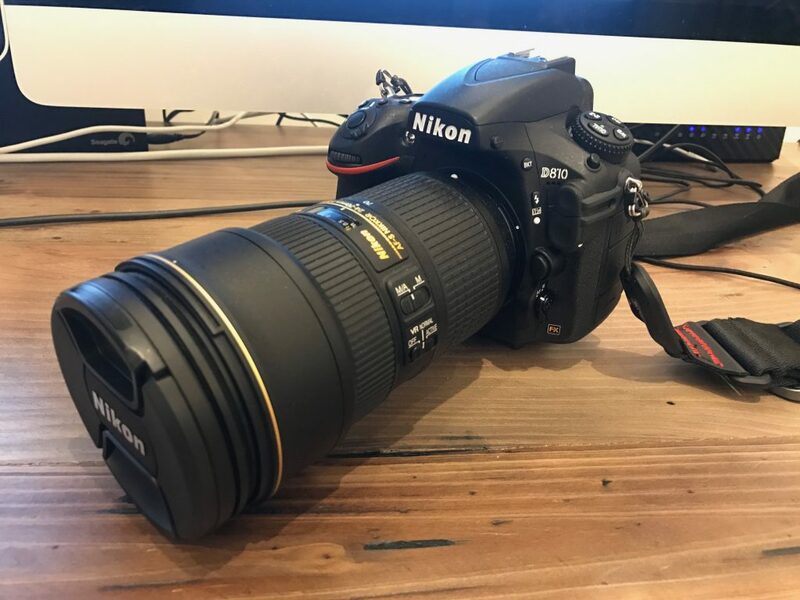 My camera is a Nikon D810 DSLR. The main lens I use for video is a Nikkor24-70 f/2.8, but I also use a Nikkor 50mm f/1.4 and a Nikkor 14-24 f/2.8 as well. This setup is generally beyond what you would need to do good quality video, but since it coincides with another passion of mine, it makes sense to use it. High end cameras and lenses like this are very expensive (they range from 1500USD to 3500USD), and I wouldn’t recommend them unless you are using them for other things. For a portable microphone setup I use a rode mini shotgun mic that mounts on top of the camera. It does an adequate job, as getting fully formed audio in the field is very difficult and usually requires at least one dedicated person to do. 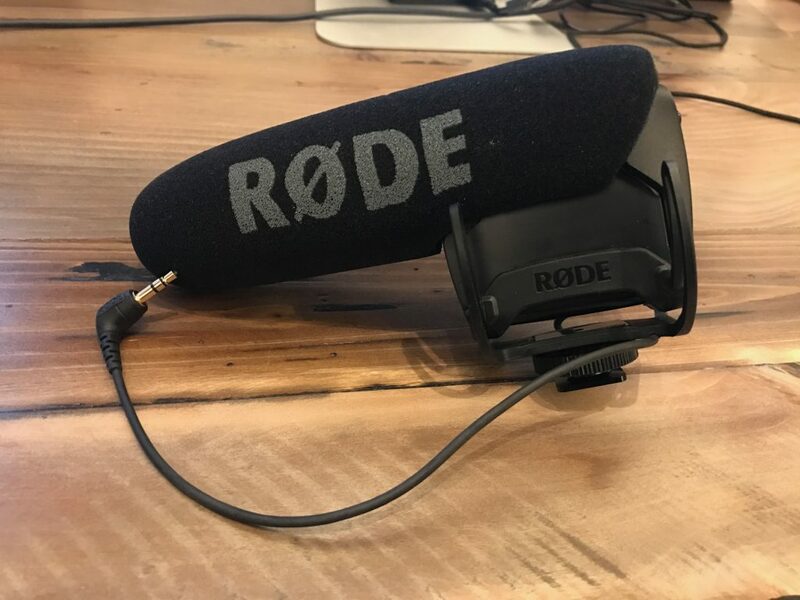 The smaller Rode shotgun mics range from 99USD to 230USD. Budget Option: Most high end smartphones are capable of very good quality video recording, even 4k if you want. Try your phone out! That covers the heavy hitters. I recommend building up your gear slowly over time, as I did. Getting all this expensive stuff at once isn’t a great plan. But using what you have, then slowly adding to your arsenal is a great way to build up to a powerful setup. It takes a long time, but it’s worth it in the end as it enables you to turn the cool ideas you have into great content. Exclusive LR Preview Cards for Kaladesh! 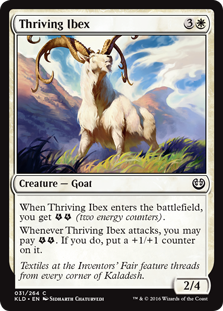 Thriving Ibex might be a goat, but it’s likely not the GOAT. Still, this card seems very solid, providing energy for various things or itself. Attacking with a 3/5 on turn 5 is no joke. I think this is the worst of the bunch? Depends on how good the energy part is. If you can use it readily for other things, I could see this being better. 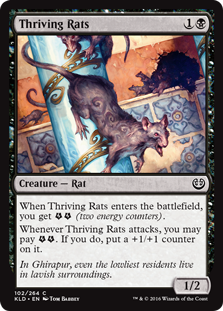 I really like these rats. They are pretty straightforward as a 2/3 for 1B, but that’s darn good. Slightly awkward that you have to attack with them first, but my guess is that late in the game you may have better places to put that energy anyway. Solid aggressive two-drop here. 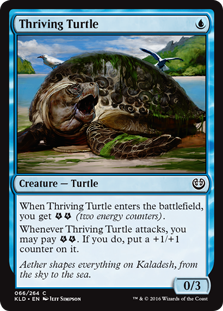 I like the idea of piling counters on this thing turn after turn. You’ll need a steady stream of energy, but if you find it, this can take over the early game. 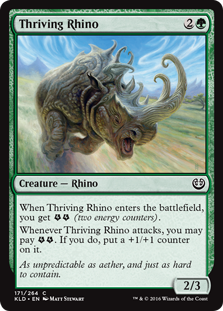 Thriving Rhino seems like the best of the bunch. This guy packs a serious punch, attacking as a 3/4 on turn 4 while leaving all of your mana and cards available. Oof.